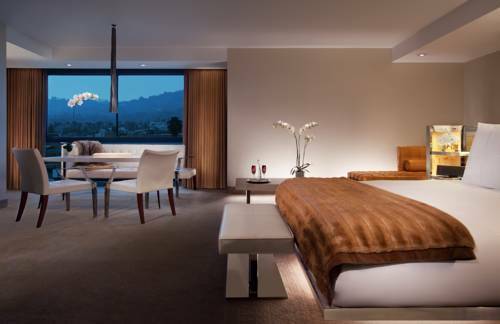 SLS Hotel, a Luxury Collection Hotel, Beverly Hills welcomes guests with superb service, chic accommodations and inspired amenities, including extraordinary dining. Relax in your lavish, pet-friendly accommodation with furnishings designed by Philippe Starck for Cassina. These modern rooms feature indulgent bedding, mini-refrigerators, banquettes, mini-bars, large desks and Wi-Fi. Upscale suites benefit from sofa beds, generous layouts and balconies or terraces with inviting views. Make a reservation for an incredible culinary journey at The Bazaar by Jos Andr s or savor cuisine at Tres or the poolside restaurant. Pamper yourself at the playful, yet state-of-the-art Ciel Spa at SLS after taking a dip in the rooftop pool or working out in the 24/7 gym. Our sophisticated indoor and outdoor venues can accommodate everything from grand weddings to private business dinners. When you are ready to explore, the hotel is near UCLA, Rodeo Drive, the Hollywood Walk of Fame and many other Los Angeles attractions. The Bazaar by Jos Andr s: The Bazaar by Jos Andr s, the award-winning restaurant in the SLS Hotel, Beverly Hills, offers pioneering creations in a modern "piazza" setting. Every morsel and libation lends itself to an unforgettable culinary experience. Tres: Sample mouthwatering fare throughout the day, at Tres, the SLS all-day restaurant and lounge. Enjoy the private nooks as you gear up for a busy day in Los Angeles, or take advantage of the private dining rooms for intimate Beverly Hills events. Altitude: Gaze over the sights of Los Angeles and Beverly Hills as you sample tempting classics, healthy snacks and refreshing drinks at Altitude, our hotel's poolside eatery. Revel in the glamour of the spot before spending the afternoon exploring Rodeo Drive.